Hebrew rhetoric has a long history, reaching back even into the early Israelite period. Recognition of rhetorical elements in the Bible can be seen in Hillel, Augustine, ibn Ezra, and Calvin, as well as among certain biblical scholars of the 18th and 19th centuries. But the revival of rhetoric and the modern method of rhetorical criticism is more recent, having begun in America among classical scholars in the early 1900s, and having been widely adopted by biblical scholars in the last third of the twentieth century. Biblical scholars today invariably have rhetorical criticism in their exegetical toolbox, but the field lacks such a comprehensive corpus of studies as the present volume supplies. Reading the Bible with an eye to the rhetorical nature of its discourse—not just the style, but its structures and modes of argumentation—gives one a sharpened view of biblical figures, their legacy, and much else in the biblical text. One also gets new insight into the audiences for whom biblical messages were originally intended. 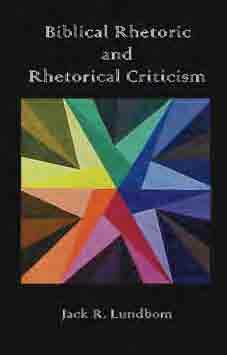 Rhetorical criticism offers a ready yield for all those seeking a closer understanding of the biblical texts. Jack R. Lundbom is Distinguished Visiting Scholar at Garrett-Evangelical Theological Seminary, Evanston, Illinois. Helpfully, Lundbom does show that rhetorical criticism can serve a number of different perspectives on the biblical text as he weaves his rhetorical analysis together with discoveries from source- , redaction- , and form-critical studies. He is comfortable using rhetorical criticism both synchronically to discuss the final form of the biblical text and diachronically to see how a proposed original version of the text was composed. This is a beneficial corrective to the suggestion that rhetorical criticism inherently is a synchronic discipline. Joel Barker, Review of Biblical Literature.